Deepavali, the festival of Lights is celebrated on the new moon day in the month of ‘Ashwin’ of the Indian lunar Calendar. It usually falls in late October or early November. Deepavali or Diwali, , is a festival of lights symbolizing the victory of righteousness over evil and the lifting of spiritual darkness. The word ‘Deepavali’ literally means ‘rows of lamps’. 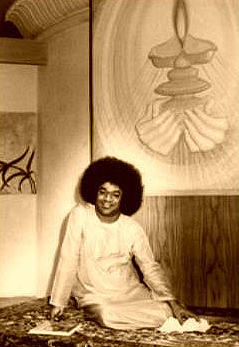 The lamp is not merely the symbol of knowledge of Truth, but also of the one Atma (spirit) that shines in all. “Today is the day on which Naraka, the demon was killed. What does this event signify? It signifies killing the demon in man. ‘Nara’ means man and ‘Asura’ means demon. This demon is present in every human being. It is not necessary to acquire great weapons to kill this demon. Man is called ‘Nara’ because there is Atma (spirit) in him. That Atma is the embodiment of love. It is possible to kill the demons only through love. Therefore, realize the Atma Tathva and develop love. This is true Bhakti (devotion)”. “The flame of a lamp has two significant qualities. One is to banish darkness; the other is a continuous upward movement. Even if a lamp is kept in a pit, the flame is directed upwards. The ancients have taught that the upward movement of the flame denotes the path to wisdom and the path to divinity. However, the external light can dispel only the external darkness, but not the darkness of ignorance in man. From the very name of today’s festival–Deepavali–it can be seen that the Divine effulgence is manifest in it. Deepavali means “the array of lights.” “Thamasomaa jyotirgamaya” (Lead me from darkness to light) is an Upanishadic prayer: This means that where there is darkness light is needed. What is this darkness? Sorrow is one form of darkness. Peacelessness is another. Loss is another. Disappointment is one form of darkness. Misery is yet another. Lack of enthusiasm is another. All these are different forms of darkness. To get rid of the darkness of sorrow, you have to light the lamp of happiness. To dispel the darkness of disease, you have to install the light of health. To get over the darkness of losses and failures, you have to usher in the light of prosperity. Looking at the Deepavali festival from the scientific point of view, it should be noted that at one time in the distant past, our ancestors lived in the Arctic region (the polar region). In this region, darkness prevailed for six months. The sun appears on Mesha Sankranthi day (the sun entering the Aries sign of the Zodiac). The sun sets in this region on Tula Sankranthi day (when the sun enters Libra). In the movement between these two signs, there is an interval of six months. After the sun sets in Libra, the dark half-year starts. Today is Chathurdasi (the fourteenth day) in the month of Karthik. It is Amavasya (New Moon day). The month is called Kaumudi. The people in the polar region used to start lighting their lamps from this day. The lighting of the lamp is not without other significance. As they would be in darkness for a long period, they described the lamp that was lit as Nithyajyothi (the perennial light). Five thousand years ago there were some planets going round the earth. Some of these planets disappear from time to time. There was one planet called Naraka which used to go round the earth. In the course of their orbits, sometimes the moon and the Naraka planet used to get close to each other. At one time, the Naraka planet appeared to be approaching close to the earth. The inhabitants of the earth were filled with dread of the approaching catastrophe. They prayed to the Lord for averting the imminent disaster and saving them. At that stage, Sri Krishna used His Prajna (extraordinary knowledge) to destroy that planet. This extraordinary knowledge of Krishna was termed Sathya. That is to say, Krishna destroyed the Naraka planet in association with Sathya. The denizens of the world started celebrating that day with lighting of lamps and adoring the Lord who saved them. That day of the Lord’s triumph was celebrated as a festive occasion. It was on Deepavali day that Sri Rama’s coronation took place after his victorious return to Ayodhya from Lanka vanquishing Ravana and his Rakshasa brood. For a long period Ayodhya had been plunged in darkness when Rama was in exile in the forest. In the absence of the effulgent Rama, Ayodhya was a city of darkness. The forests were filled with light. The return of Rama was hailed by the people of Ayodhya as the return of divine effulgence and hence they celebrated the event by the lighting of lamps everywhere. Nor is that all. Today’s festival is marked by other significant features. This is the day on which the Lord in His Vamana incarnation sent the Emperor Bali to the Nether World after He had got the promise of three feet of ground (measured by the Lord’s foot) from Bali. Vamana (as the incarnation of Vishnu) used the gift of three feet of land to put down the Ahamkara (egoism) of Bali. Bali is described as Chakravarthi (sovereign lord). In every human being there is a sovereign who presides over all his qualities. That sovereign is the Ego. This sovereign Ego–Ahamkara Chakravarthi–suppresses all the good qualities in man. Ahamkara has another meaning. It is the very form of Aham the “I’. The egoist is one who identifies the body with his Self. But you are not the body The body is only an instrument. It is an agglomeration of material substances. How can this inert body be equated with the Self?. It is the association of consciousness with the body that it is able to undertake various activities. Deepavali is a festival which is designed to celebrate the suppression of the Ego by the Higher Self. Man is plunged in the darkness of ignorance and has lost the power of discrimination between the permanent and the evanescent. When the darkness of ignorance caused by Ahamkara (the ego-feeling) is dispelled by the light of Divine knowledge, the effulgence of the Divine is experienced. Deepavali is also the day on which Emperor Vikramaditya ascended the throne. It is for these various reasons that Deepavali has been observed by Bharatiyas, young and old, as a day of great rejoicing. However, the lights lit on Deepavali day remove only the external darkness and not the darkness within man. Even when the sun shines brightly, his light cannot dispel the inner darkness. For this purpose, you have to learn a lesson from the external light. For instance, if you want to light a lamp, you need a container. You have to fill it with oil and place a wick in it. You need a matchbox to light the wick. Only when you have all the four accessories can you light the lamp. The lamp cannot be lit if any one of them is lacking. This lamp dispels the external darkness. As the wick burns, the oil is consumed. When the oil is exhausted the flame goes out. Saint Ramadas compared human life to a lighted lamp and declared in one of his songs that when the oil of life ebbs away, neither the wick nor the light will follow the departed. If the darkness of ignorance is to be dispelled, man needs a container, oil, wick and a matchbox corresponding to what an external lamp needs. For man, the heart is the container. The mind is the wick. Love is the oil and vairagya (sacrifice) is the matchbox. 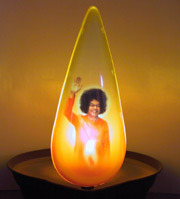 When you have these four, Atma-jyothi (the Divine flame of the Spirit) shines effulgently. When the light of the Spirit is aflame, the Light of Knowledge appears and dispels the darkness of ignorance. The flame of a lamp has two qualities. One is to banish darkness. The other is a continuous upward movement. Even when a lamp is kept in a pit, the flame moves upwards. The sages have therefore adored the lamp of wisdom as the flame that leads men to higher states. Hence, the effulgence of light should not be treated as a trivial phenomenon. Along with lighting the external lamps, men should strive to light the lamps within them. The human estate should be governed by sacred qualities. This calls for the triple purity of body, mind and speech–Trikarana Suddhi (purity of the three instruments). The inner significance of Deepavali is to lead man from darkness to light. Man is perpetually plunged in darkness. Every time he is enveloped in darkness, he should light a lamp that is ever shining within him. Carry that lamp wherever you go. It will light your path wherever you may be. 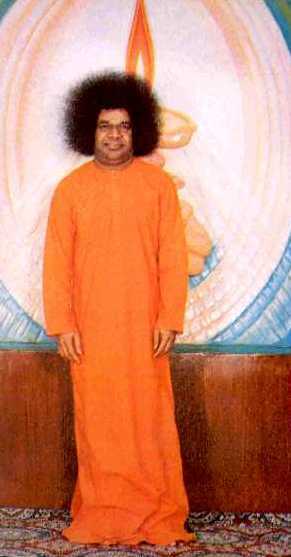 This entry was posted in Puttaparthi, Sai and tagged Deepavali, Diwali, Sai Baba. Bookmark the permalink.